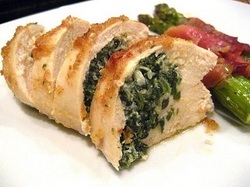 Fillet chicken breasts by cutting a "pocket" horizontally into the center of the meat about 3/4 of the way down, being careful not to cut through to the other side. Use a paper towel to absorb any water inside the breast. In the middle of each breast, spread one wedge of laughing cow cheese. Top with about 2 Tbsp spinach and 1 Tbsp mushrooms. Fold over the close. Secure with a toothpick if needed. Season the outside of the chicken with Italian Seasonings (or any seasoning of your choice) and a little Parmesan cheese.